The ceremony of announcing and awarding the Sao Khue titles was held on April 21th at Youth Theatre of Vietnam. 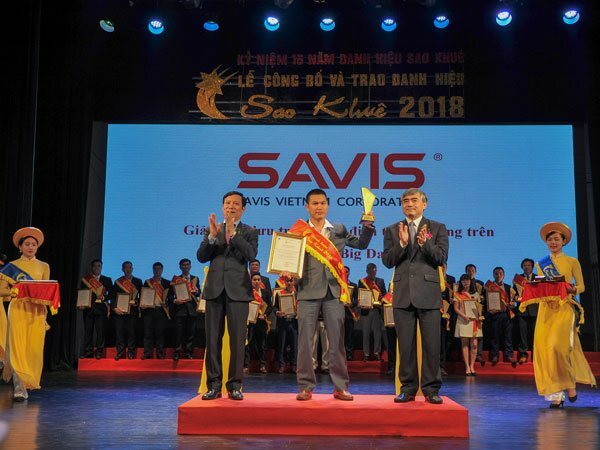 Deputy General Director Vu Quoc Huy has represented SAVIS to receive Sao Khue award. Attending this important event, there were leaders of the Ministry of Information and Communications, leaders of the National Assembly (NA) Committee on Science, Technology and Environment, the Party Central Committee, the Ministry of Industry and Trade, Hanoi People’s Committee together with more than 500 delegates from IT companies in Vietnam. After strict evaluation, SAVIS Digital Preservation Management and e-Archive solution has been honored as a typical product of IT industry in Vietnam. This solution is considered to include many outstanding features and contain global trend in technology. It solves the problem in data storage of large firms, helps build a unified archive system that ensures collaboration between departments across multiple locations as well as boots IT investment and reduces risks in archiving. SAVIS Digital Preservation Management and e-Archive solution based on the Open Archival Information System (OAIS) and in accordance with ISO 14721: 2012 recommended by national archives of the United States, Australia, United Kingdom and other developed countries. Accompanies with strict security mode, the system save transaction history per session and uses SSL to authenticate and encode information between the client and server. Sao Khue Award has been held annually by the Vietnam Software and IT Services Association (VINASA) since 2003, under the auspices of the Ministry of Information and Communications. The purpose of the program is to select, rank and honor typical IT products and services, thereby orienting the market and customers, contributing to the development of the IT software and services industry of Vietnam.